Here's a nice TV GUIDE print advert hawking (ahem) Flight of the War Witch, the feature-length final episode of BUCK ROGERS IN THE 25th CENTURY season one. In a freaky coincidence, I was actually watching this particular Buck outing last night whilst absent-mindedly cruising the web... and stumbled across this. The art (uncredited) is pretty faithful to the aired episode. Buck looks like he's drawn from any number of first season publicity pics. Twiki is portrayed without Theopolis (which is a little weird as, in terms of merchandising and publicity, the two were generally inseparable). Newmar, as Zarina (the titular War Witch) is as she appears in the episode. Hensley is also depicted in the outrageous gown she dons in the show. The episode is undeniably ambitious and looked like a belated attempt by Universal to boost the show's credibility (and ratings) just before NBC decided whether to forge ahead with Year Two (they did, in a drastically retooled fashion). 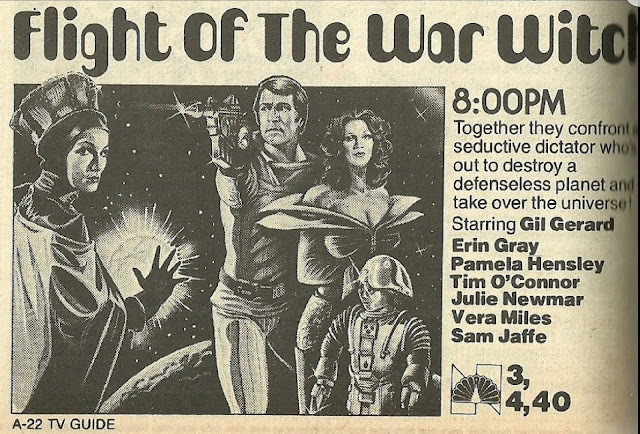 It boosts better-than-average production values, a lot of new effects work from the guys at Universal Hartland and a great cast (guest star Julie Newmar AND another appearance by the delightfully camp Pamela Hensley). I've not seen anything to back this hypothesis up, but I also suspect Universal were willing to sink a few extra dollars into this story because it could (but wasn't) be repurposed as a second Buck theatrical flick in overseas markets (BATTLESTAR GALACTICA's The Living Legend and Fire in Space also benefited from an extra cash infusion and formed the movie MISSION GALACTICA: THE CYLON ATTACK). NBC did bring Buck back (after despatching the existing production team) but the retooled Year Two (sending Buck, Wilma and Twiki into space aboard the Searcher) failed to impress (although the feature-length opener, Time of the Hawk, isn't bad).